It's been a staggering 40 years since the American songwriter scored his first U.S. hit single, "Piano Man", and even longer since releasing his very first full-length album, the low-budget "Cold Spring Harbor" in 1971. In fact, Billy Joel has been around for far longer than that - in the '60s he tinkled the ivories in the lesser-known outfit The Hassles and rock splinter-group Attila. For such a lengthy career-path, you'd expect Joel to be in his seventies, pottering about his mansion garden and clutching a brandy in one hand and a Saga holiday brochure in the other. You've got to be kidding, right? For a start, Joel has barely settled into his sixties and still makes music, despite not releasing a commercial album for some twenty years - his last was the successful "River of Dreams" set. He has issued classical piano-music - 2001's "Delusions and Fantasies" was written by Joel and performed by Richard Joo - and he toyed with the idea of an autobiography. It's still on hold. News of his first UK dates for 7 years and his first ever indoor Ireland show will be greeted with rapture and glee. The man's canon remains impressive to this day and fans young and old 'get' Joel's deft compositional skills and classic hits. 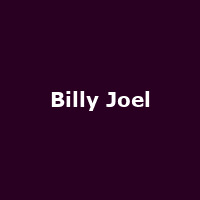 "Just The Way You Are", "My Life", "Piano Man" and "An Innocent Man" effortlessly rub shoulders with the perkier "Uptown Girl" (#1 forever in 1983 and produced by the late Phil Ramone), "Tell Her About It" and "We Didn't Start The Fire". And no doubt you'll get to hear a few of these at his next shows. First UK stop is Manchester Arena on 29th October, followed by the Hammersmith Apollo on 5th November, and finally Birmingham's LG Arena on 8th November. Tickets are on sale now, priced from £55 to £85. The aforementioned landmark Irish show at Dublin's O2 will take place on 1st November. Tickets are on sale now, priced at €76 - €95. Demand is likely to be huge for 'The Entertainer' and you can expect a cracking show.